Here's a couple of pictures of an actual bank in Cosby, Tennessee. (Complete with drive thru) Not exactly trashy, but worth a picture! Very creative, but would you put your money in there?! These pictures were sent to me from Aransas Pass, Texas. 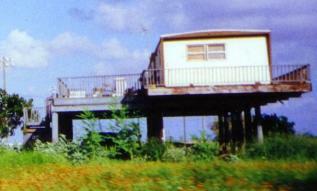 (near Corpus Christi) As you can see, the owners of these lovely trailers always wanted a beach house. 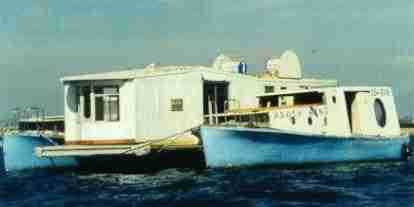 This picture is from Dadeville, Alabama. There are so many junk cars, that you can hardly even see the trailer. They make great yard decorations, and just think... no more having to go to the auto part store! 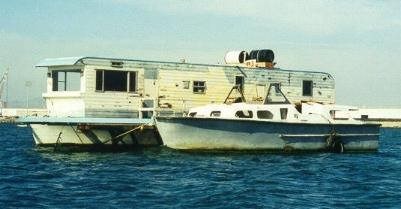 In San Diego Bay California, trailer trash likes to be nautical, too! If they get bored of their surroundings, they can just weigh anchor and go!